​Parker RL4 Relief Valves are designed such that when the upstream pressure exceeds the closing force exerted by the spring, the lower stem opens, permitting flow through the valve. Flow through the valve increases proportionately to the increase in upstream pressure. ​Parker RH4 Relief Valves are designed such that when the upstream pressure exceeds the closing force exerted by the spring, the lower stem opens, permitting flow through the valve. Flow through the valve increases proportionately to the increase in upstream pressure. ​Parker MPR series relief valves are offered in pre-set relief ranges from 1500 to 20,999 psi. 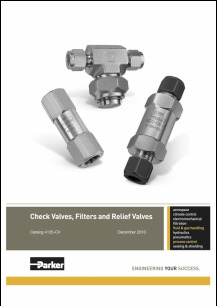 Relief valves are tagged with the proper factory pre-set pressures.